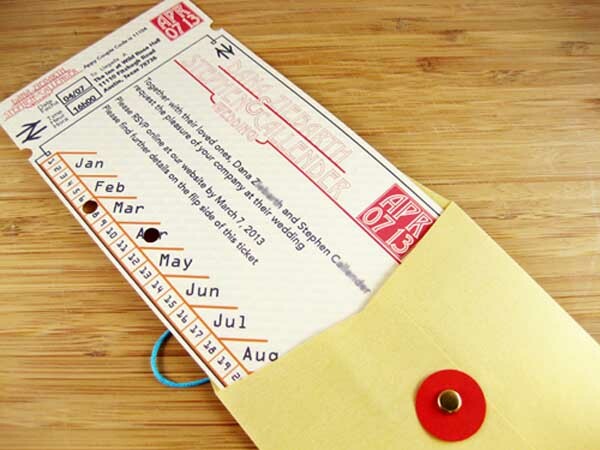 We first revisit Stephen C.’s gorgeous train-ticket inspired wedding invitations. His invitations demonstrate that minimal, high quality materials like our #10 gold shimmer envelopes and #10 notecards are enough to really make your own design ingenuity shine! Next, we created a simple yet glamorous Oscars Party using gold chevron as our theme. Last year, we used wrapping paper for placemats, but now, we have fantastic, customizable placemats in a variety of colors and designs including the very Oscar-worthy Gold Confetti! 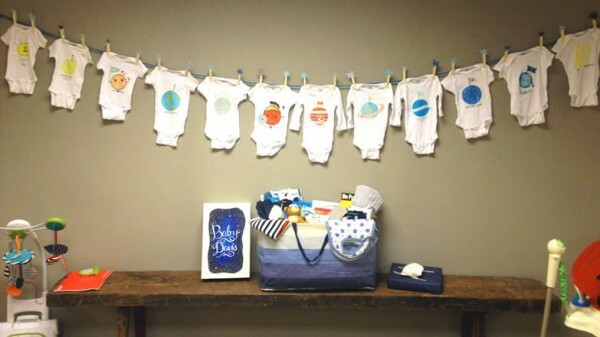 In the summer, we threw an outer space-themed baby shower for our beloved art director, Karen. Small details and simple supplies made all the difference in this ethereal bash: a sundae bar with celestial-themed toppings, hand-painted onesies themed after the solar system, and a gorgeous, hand-painted keepsake box to hold them in! Later in the year, we were inspired by Houston customer Kristina’s paper wedding décor! 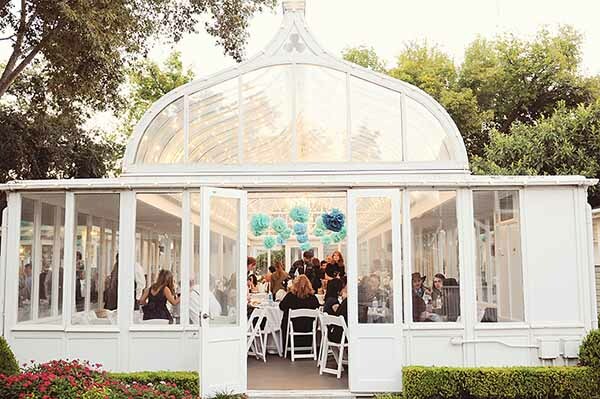 Kristina proved that a small wedding budget makes for a no less gorgeous experience than an expensive one. Her pool-colored pompoms, pinwheels, and large-scale paper flowers created a festive and personal atmosphere; after all, most of the decorations were made by herself and a bridesmaid. She even created her own miniature pinwheel cake-topper! We’re looking forward to 365 more days of making everyday celebrations extraordinary! That’s what we love so much about partying with paper: it’s beautiful, economical, and best of all– with the advice of any Paper Source store associate or this blog– incredibly easy to realize your creative vision for your next event. So, to send this year off right, we’d like to turn it over to you: what is one of the best party hosting/decorating tips you’ve ever learned from Paper Source? Tell us in the comments, and one lucky winner will receive a $100 gift card! Comment by January 9, 2014. Winner will be selected at random on January 10th and notified via email. A great, big thank you to all of you for your readership, participation and creativity! Ooh, I loved learning how to make paper flowers! They are so pretty and can be brought out again and again for parties. Also, I made some for my friend whose cat always eats any real plants in her house and then gets sick…so my friend can have the cheeriness of flowers around without the cat getting sick. One of my FAVORITE Paper Source items is the handmade papers and wrapping papers. I love the look of the pretty papers clustered together made into folded rosettes. They look brilliant for any decor: b-days, baby showers, bachelorette parties, and on and on! I love learning “How To Make Paper Rosettes”. They are so easy and can be used for so many things … Party Decorations, Gift Wrap Bows, Card Embellishments, etc. Thank you so much for the opportunity to win!!! I especially loved the how-to tassel garland you shared with us back in July. So festive and fun, this garland will truly make any occasion extra special. Your tutorials and great ideas will definitely help as I prepare to host my sister-in-laws upcoming baby shower! I love you Paper Source! Sticker labels make everything a little more cheery! I love the paper table runners. I would love to see them in more colors! I also adore the paper flowers and hope you keep coming out with new styles! The first time I ever went to a Paper Source I had someone demonstrate the envelope liners template. That was my first purchase and I have used them a million times since then! 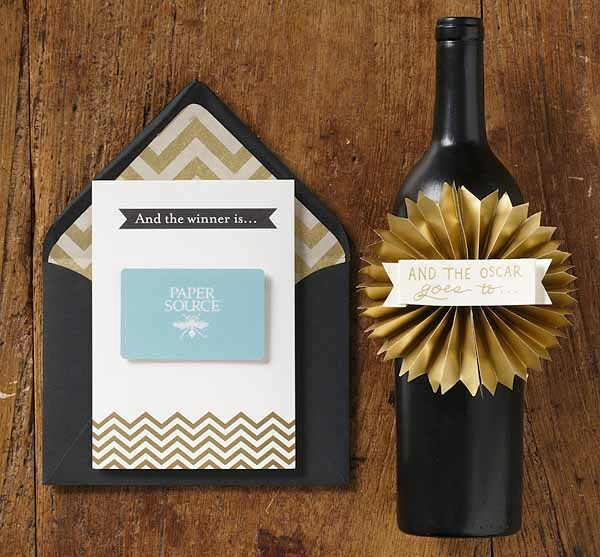 Great for invitations and all occasions. One of the best tips I ever learned (and continue to constantly re-learn) from the Paper Source is how to tie bows and square knots! I used these tips for my wedding invitations and have used them for countless bows tied on gifts and cards ever since! One of my favorite ideas for weddings is a to get a beautiful illustrated book from the area to have everyone sign. For example, we had a destination wedding in Kauai and bought a book at a local store filled with images of the island for our family to sign. Works great for destination weddings but just as easily in your hometown and really adds a personal touch. The video of tying square knots. You satin ribbon is the best. One of my favorite ideas was making hamburger invites for a BBQ! It used various round cards and they were perfect for a Spongebob party as Crabby Party invites. Everyone loves their own initials! I personalize everything I mail– even just a first inial on the envelope is a surprise and delight! It makes the mass mailing of Christmas cards a little more magical. And, I just remembered another great piece of advice: glitter covers a multitude of mistakes. When in doubt, distract with glitter! The detailed instructions for what all goes into wedding invites, from paper measurements to paper weights – this is by far the most helpful blog post I have read and keep coming back to for “where to start and begin” when designing my invites. Thank You! Stamping and embossing are my favorites! I like sending your letterpress cards. Wreaths of any sort are beautiful for seasonal decorations, and garland always makes a room look more festive! My sister and I love to make place cards for birthday parties and other special occasions. Since a new Paper Source opened near us, we having been going there to get craft supplies and other fun art things. On the place cards, we have used glitter, stamps, pens and fun paper. Thank you so much for the opportunity to win and for providing our town with fun craft ideas!